The top reordered hardcover was Marvel's Vision, a $39.99 edition collecting Tom King's limited series, which shipped January 10. 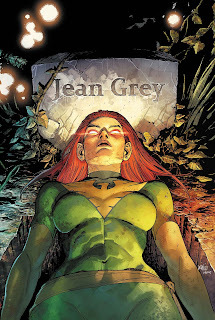 The top reordered comic book was Marvel's Phoenix Resurrection: The Return of Jean Grey #3, an issue that also shipped January 10. As of this writing, it appears to be close to sold out at Diamond. The leader the past three weeks, Hawkman Found #1, was out of stock at Diamond last week and does not appear in the list. Image's Saga Vol. 8 trade paperback, the top graphic novel for December, was the top reordered softcover for the second week in a row. These are items that have not yet shipped, but for which the Final Order Deadlines have passed. These reorders, if books are available to fill them, may or may not land in the same shipping month as the books' release weeks, so a book's presence on this chart can mean that an item might make a repeat appearance in Diamond's monthly top-seller charts. It was mostly comic books in the advance reorder list last week. 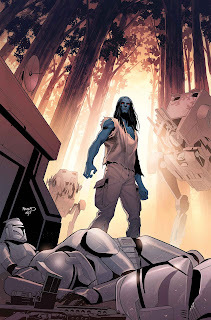 Topping the list among comic books and overall was Star Wars: Thrawn #1, launching Marvel's take on Timothy Zahn's character from his novels at Del Rey. The issue is set to go on sale Feb. 14. The top advance-reordered comic book shipping in March was yet again the Oblivion Song by Kirkman and De Felici Collector's Edition from Image. It's expected to go on sale March 7. The Action Comics #1000: 80 Years of Superman book repeated in the top hardcover slot; it's been first three out of four weeks. It's an April 11 title. Once again, there weren't any trade paperbacks in the Top 25 at all.